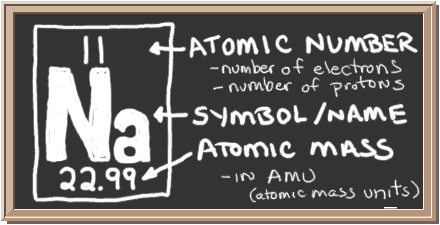 So... for the element of SODIUM, you already know that the atomic number tells you the number of electrons. That means there are 11 electrons in a sodium atom. 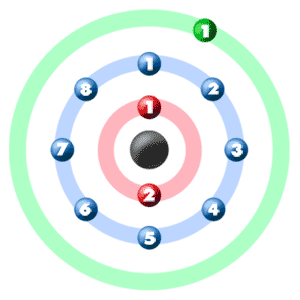 Looking at the picture, you can see there are two electrons in shell one, eight in shell two, and only one in shell three. ► More about the history and places to find sodium. This is sodium chloride, also known as table salt. Most people scientist know that the formula for salt is NaCl. One sodium (Na) atom gives it's electron to one chlorine (Cl) atom. Chlorine then has the eight electrons in its outer shell to make it "happy". 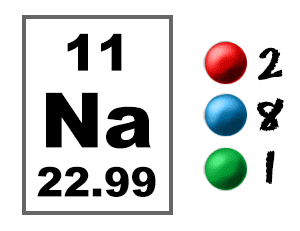 Sodium is "happy" because it has now given up its one extra electron. So now you have Na2O. When sodium (Na) atoms bond with one oxygen (O) atom, there have to be two sodium atoms, each with an extra electron. Each of these sodium atoms gives oxygen one electron, allowing oxygen to have a full shell with eight electrons. See how the electrons are shared?